Janesville, WI -- Gwendolyn "Gwen" Broege Daluge, Janesville, WI, died on April 12, 2019, shortly before her 98th birthday. Gwen was born on April 27, 1921 in Janesville, daughter to Edgar and Leta Broege. 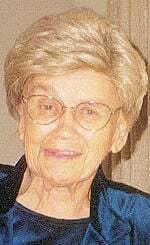 She graduated from Janesville High School in 1938, and earned a BS in Home Economics Education in 1942, and an MS degree in 1976, both from UW-Madison. After college, she taught Home Economics in Spring Green, WI for two years, and was a county extension Home Economist in Washington County for the next five years. She married Harlan Daluge in 1946, and returned to Janesville to dairy farm, work part time, and raise her family. In 1964, Gwen returned to teaching, and taught high school home economics for twenty-one years. Gwen was very active in several organizations, including the American and Wisconsin Home Economics Association, WREA, AARP, Zonta service club, 4-H, 5-H, Delta Kappa Gamma, PEO, and Phi Lamda Theta. She was named the Wisconsin Home Economics Teacher of the Year in 1979, and the Distinguished Alumna of the School of Human Ecology at UW-Madison in 1981. In 1996, Gwen was named one of the four Janesville YWCA Women of Distinction. In retirement, Gwen was very involved with the Janesville Retired Teachers Association, WREA, as well as working on behalf of the AARP Wisconsin Health and Long-Term Care committee. She was recognized for these efforts in 1994 with the National Community Service Award from AARP. Gwen loved to travel, visiting many countries around the world. She rang bells for many years in the First Congregational Church Bell Choir, was a Sunday School teacher, and served on the church consistory. Gwen was very loving and caring, and she touched the lives of many people over the course of her life. She was extremely devoted to her family and friends. Another facet of Gwen that could not be overlooked was her strength during times of adversity. Life was not always easy, particularly in her later years, but she approached each day with a positive attitude, and a smile that was felt by all those around her. She is survived by her children: Rick (Peggy) of Madison, Amy Behm (Vince) of Hampton, VA, Peter (Diana) of Janesville, and Carla Voss (Gary) of Woodstock, IL; grandchildren: Tracy, Mark, Tripp, Chris, Peter, Bridget, Erin, Megan, Tyler, Joshua, Christopher, and Blair; and great-grandchildren: Josie, Carter, Harper, Remington, IV, Ian, and Lillian; and nieces and nephews. Gwen was preceded in death by her parents; her husband, Harlan, who died in 1985; and her two brothers, Elton and Forrest Broege. A memorial service will be held at 2 p.m. Saturday, April 20, 2019 at First Congregational United Church of Christ, 54 S. Jackson St., Janesville. Rev. Tanya Sadagopan will officiate. Visitation will be at the Church Saturday from 1 p.m. to 2 p.m. Interment will be in Emerald Grove Cemetery. In lieu of flowers, memorials may be given to First Congregational Church of Janesville, Cedar Crest Retirement Center, or the Wisconsin Home Economics Association in Gwen's Memory. Henke-Clarson Funeral Home is honored to be assisting the family. The family would like to thank the staff at Cedar Crest and Agrace Hospice for their care and support.